Today was sadly the last of our 2013 trip to Japan! All wasn’t yet lost however, as our late flight meant we still had one more half day to enjoy the sights of Kyōto. Breakfast wasn’t included at our Daiwa Roynet Hotel, though Kate opted to pay extra on the day to enjoy a buffet of western and Japanese style foods. I only heard later that it was really good because while Kate went down to breakfast I stayed in the room to continue last night's battle with my books and luggage. I maintain that the capacity of a container is limited only by the amount of times you can re-arrange its contents. Anyway, after Kate and I had finished our morning activities we checked out of the hotel and asked to leave our luggage with reception. As I had yet to eat anything we went to a nearby Starbucks for a hot chocolate and my last cherry muffin; which was delicious! First on the sightseeing agenda was a visit to Ginkakuji and then a walk down the philosopher's path, from which we'd visit a few other nearby temples. Ginkakuji (銀閣寺 = Silver + Tower + Temple) is one of Kyōto’s most famous Zen temples and was originally built as a place of rest and solitude for the Shōgun Ashikaga Yoshimasa in 1482. The temple is located in Higashiyama and was modelled after Kinkakuji (金閣寺 = Gold + Tower + Temple), which was the shogun’s father’s villa. Unlike Kinkakuji, Ginkakuji was/is not gilded in precious metal and the name came about more as a nickname to contrast the two. Early in its history, Ginkakuji became the focus of Higashiyama Culture which saw the promotion and development of traditional Japanese arts such as Noh theatre, tea ceremony, flower arrangement and poetry. After Ashikaga Yoshimasa’s death in 1490 the villa was converted into a Zen temple and remarkably the original Kannon Hall (Silver Pavilion) and the Togudo buildings still stand today. Apart from the buildings, Ginkakuji is also well known for containing a large rock garden and a moss garden that leads up a viewing area on a nearby hill. As today was a sunny spring Saturday morning, Kyōto was pretty busy and upon arriving at the station we joined a really long line for one of the buses us out to Ginkakuji. I actually thought we’d have to wait for the bus after next, but somehow we managed to squeeze on. At some of the first stops past the station the bus was so full that additional people could not really board but did anyway (think Tōkyō rush hour), but as time went on and we passed major attractions, numbers waned and we were eventually even able to secure seats. Incidentally, one of the other attractions we spotted in the distance was the Heien shrine, which we had visited on a rainy day during our first trip nearly two years ago. The sight brought back memories. Eventually the bus reached our stop so we hopped off and walked past some shops up to Ginkaku Temple. The stores were touristy and not as good as the ones we’d seen in Arashiyama a week or so ago though were not terrible either. Upon reaching the temple we paid the 500 yen admission to receive a ticket and an English pamphlet. Inside the temple was pretty busy with lots of school students. Unfortunately and unusually though, none approached us to practice English. Along with everyone else we followed the marked route around the garden and the outside of the buildings. Rocks featured heavily in the first garden and were very impressive. One particularly interesting element was some sort of cone structure with no top called the “Moon Viewing Platform”. The material evidently had quite a high angle of repose. Next we saw the ancient Silver Pavilion! It looked pretty old and was surrounded by a beautiful garden with lots of blooming flowers and small ponds. We could see a few other buildings too which were built in a similar style. The route we were following led up a mossy hill to a lookout area that gave us a great view over the temple and the buildings and hills of the rest of Kyōto in the distance. On the way back down we had a final look at the Silver Pavilion before exiting the temple and making our way over to the philosophers path. This path is apparently really pretty during the cherry blossom season, though as it was now late spring the blossoms were gone and the path wasn’t super amazing. However, we did still enjoy walking past the many temples with everyone all the same. One side of the path had a line of trees and the other dropped down to a flowing water channel in an old canal. Inside the water we could see some really big carp! Beyond the trees on the other side of the path there were some houses and a few shops. The canal itself is actually quite interesting as it’s part of a channel that tunnels for twenty kilometres through mountains all the way to Lake Biwa and was used to power one of Japan’s earliest Hydroelectric power plants. We'd be seeing a bit more of it later. Of the many temples available we had pre-picked out a few to check out, the first of which was Eikandō. On the way over we passed some cute cats in a carriage! Eikandō Temple (永観堂 = eternity + viewing + hall) belongs to the Jōdō or “Pure Land” sect of Japanese Buddhism and was originally a court noble’s villa back in the Heian period (710-1185). After the villa was donated to a priest it became a Shingon sect temple and the current name is attributed to a popular head priest (Eikan) from the 11th century. It wasn’t until two centuries later that the temple was converted into a one of the Jōdō sect by a different head priest. Upon arriving we paid 600 yen to enter and then spent about an hour wandering around the lovely large gardens and ponds of Kikandō. We then went over to the building to follow a board walk that led through and along some beautiful temple structures. We weren’t allowed shoes or cameras for this section so there are no photos of the beautiful fusuma artwork we saw inside. Eventually we reached a section at the top where we could take photos of the great view of Kyōto and the distant mountains. After a final look at the garden, ponds and some orange leaved trees, we made our way back out of the temple and continued down to Nanzen Temple. Nanzenji (南禅寺 = South + Zen + Temple) is known as of the most important Zen temple in all of Japan as it is the head temple of the Rinzai sect of Japanese Zen Buddhism. Like many of Kyōto’s temples around here, Nanzenji was originally a retirement villa and in this case belonged to the Emperor Kameyama back in the 13th century. It was later converted into a Zen temple before being completely destroyed in during civil wars a couple of hundred years later. All the buildings currently standing at Nanzenji were therefore built later, and many date from around that time, such as the Sanmon entrance gate, constructed in 1682. Unlike the previous two, this temple had free entry to the central area, with the many individual gardens and buildings within charging individual admission. The first of these I visited was the aforementioned Sanmon temple gate where, after paying 500 yen, I was able to climb up inside to a balcony at the top. I say “I” because Kate was too stingy to pay and decided to wait at the bottom! Her loss I thought because the gate was well worth it and I had lots of fun climbing up the narrow steps inside. 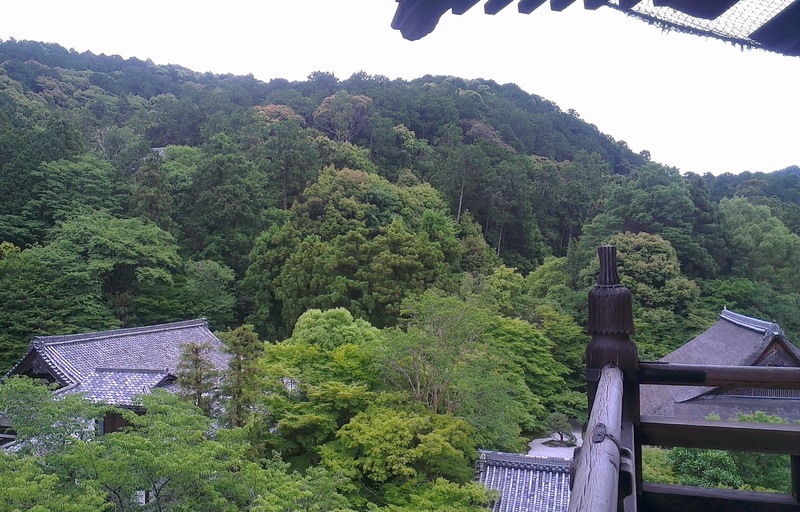 The top balcony has fantastic views down over the trees and temple roofs and is high enough that the city of Kyōto is visible in the distance. The surrounding mountains are also well worth a look. The platform at the top went all the way around and provided both a 360 degree views and a place for a few tired tourists to rest. I made sure to take my time and enjoy the view! Back down at the bottom we wandered around a little more and were approached by a Japanese guide lady who asked us in English if we had any questions. We said no at first, but ended up coming back to ask her to take our photo of us as she was looking a little lonely. She looked really pleased to fulfil our request! The next feature we checked out was an old brick aqueduct located towards the back of the temple. This is actually a continuation of the canal the philosophers path follows and was constructed around one hundred years ago during the Meiji Period to connect Kyōto with Lake Biwa. The aqueduct structure was pretty cool and looking through the line of columns was fun! Even more fun was the fact that we could walk all the way up and climb along the top for a short distance. It’s still functioning even today and there was a decent amount of quickly flowing water down the bottom of the canal. Anime fans might recognise this structure and I at first though that perhaps I'd been here before but couldn't put my finger on it. 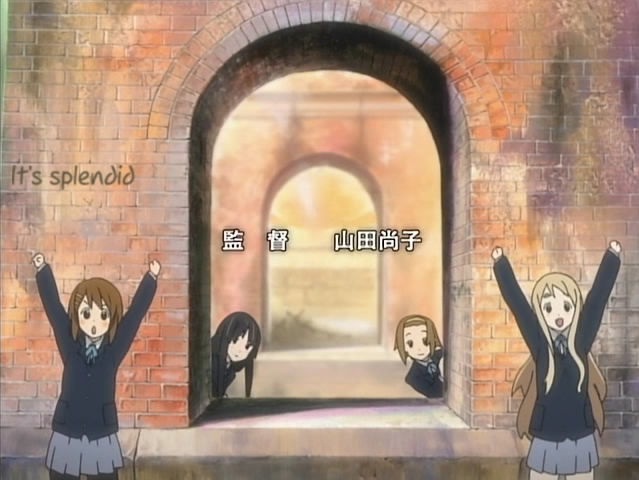 However when I looked through the arches I suddenly realised that the location was featured in the OP of K-On! After the aqueduct we continued on to a nearby garden that cost ¥300 to enter. Inside we found a nice old building as well as a small but beautiful moss garden surrounding a pond with little waterfalls. There was another bigger garden next door but we ended up skipping it because, believe it or not, I was way too hungry to go on. It was only 1:30pm but as we didn’t really have a big dinner last night, or the night before and breakfast for me this morning was only a muffin. I guess it all caught up with me. I looked around fruitlessly for some strawberry milk (for some reason) as we walked over to a nearby subway station to catch a train back to Kyōto Station. Inside the Kyōto Station building somewhere I ended up deciding on a sashimi meal which was delicious and filled me up. Full disclosure; I don’t think I completely enjoyed all of the different types of raw fish on offer. Though most of it was pretty good. Lunch was my second separation with Kate for the day as she went to a nearby café to get a lighter lunch. 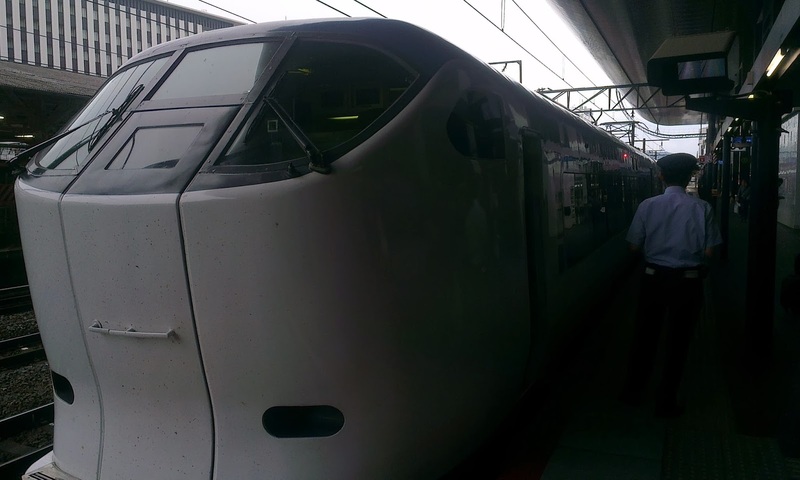 After meeting back up we went down to the ticket office and used our JR-pass to reserve a seat on the 16:15 Limited Express Hakura which would take us to Kansai International Airport in time for our 20:50 flight this evening. As it was still only around two o’clock, we had a little bit more time in the day and decided to make Sanjūsangendō temple our last attraction in Japan. Sanjūsangendō is a bit of a walk east from the station, but we figured it was probably faster and certainly cheaper than finding public transportation. The cost was especially important to us as we were running low on money and as we walked we kept an eye out for a post office so we could do a small top up from their ATM’s. The other option to withdraw money, 7-11’s, only allows amounts in 10,000 yen ($100) denominations, which is a bit too much. Unfortunately, while we did find some post offices along the way we were disappointed to find them all shut. Luckily we still had enough cash to pay the 600 yen admission to Sanjūsangendō, though we could do this only after we’d managed to find, with difficulties, which one of the building complex’s long sides contained the entrance! Sanjūsangendō (三十三間堂 = three + ten + three (thirty three) + interval + hall) is more correctly known as Rengeo-in (蓮華王院 = lotus + flower + king + temple) and is a temple famous for its long wooden hall which contains 1001 statues of the goddess of mercy, Kannon. 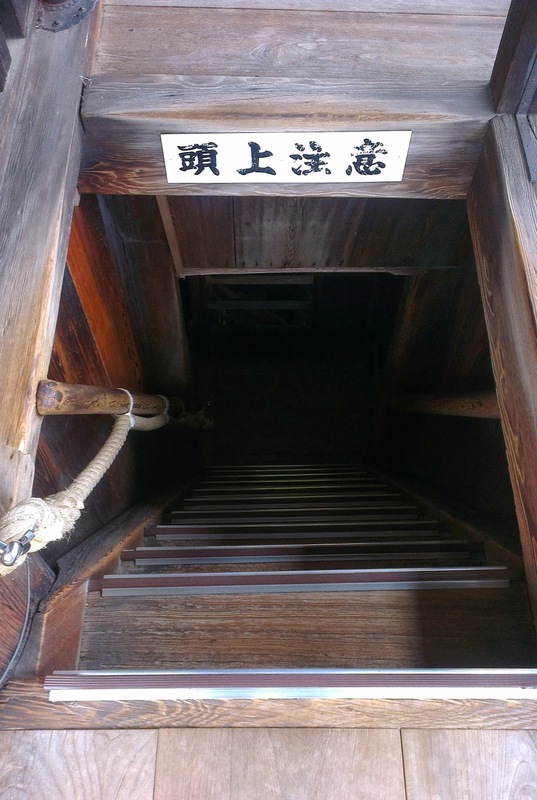 The 120m hall is Japan’s longest wooden structure and was built in 1266 after the original temple burnt down in a fire. The popular name “Thirty-Three Interval hall” arose due to number of intervals between the buildings wooden support columns. One thousand of the Kannon statues are quite large, about the size of a human, and each have one thousand arms, although only 42 of them are in this plane of existence. Right in the centre of the many rows is an even bigger wooden statue which brings the total to 1001. The grounds inside were very busy with heaps of school children! Unfortunately, continuing the trend for today, they were not at all talkative. Apart from the school children there were also many tours and a decent amount of international tourists. The main long building dominated the grounds and we made our way over promptly. We were not allowed to take photos inside and also had to make sure to take our shoes off and leave them in one of several large shoe storage rooms. Within the building we found hundreds and hundreds of wooden cypress Kannon statues lined up ten deep. Most looked largely the same but here and there we could see some slight difference. Overall with them all together the display was very impressive and imposing. Once we reached the end of the line of statues the route took us back around to the area behind the statues where we could learn about the history and see displays of some other items. The information mentioned that 124 of the statues are actually from the original hall and the rest were reconstructed after the hall burnt down in 1249. After reaching the end we wanted to stay longer to explore the rest of the grounds, but unfortunately had to leave as we were out of time and needed to head back to the hotel to collect our luggage. Lots of trains moving at different speeds! Since we were located on the other side of the station we had quite a long walk back to our hotel but the streets we passed through were interesting and I was sad in the realisation that these were some of our last moments in Japan. After collecting our luggage Kate found an ATM to top up the remains (all 158 yen) of her money. Upon arriving at Kyōto Station we found the journey to our train was far from over as we had to travel all the way down to the distant platform 30. The route we ended up following also meant we had to battle our luggage up and down a few steep staircases, so upon arriving we were pretty exhausted. I was in a bit of a mopey mood during the train ride and sadly gazed out the windows taking photos as our last glimpses of Japan flickered past. Some of the sights we saw were quite actually interesting, such a colossal Meiji chocolate bar, which is the Guinness world record holder for world's largest billboard! After about seventy seven minutes we crossed the Sky Gate Bridge and arrived into Kansai International Airport at around 5:30pm. The check in counter for Jetstar wasn’t too far away and was easy to spot thanks to the long line of waiting people. Since we had yet to weigh our luggage I had a look around the airport for some scales (while Kate saved us a spot in line) and managed to find a set at an information counter. We took turns weighing and re-arranging before jumping back in line and slowly making our way to the counter. After checking in we went and got some food at McDonalds. For some reason this has become a bit of a tradition on our flights back to Australia from Japan as it’s the only time Kate ever eats food from there. Personally I don’t normally eat it but will have something from them probably half a dozen times a year. Kate just had a cheeseburger meal while I got the monstrosity known as the large double quarter pounder meal. Anyway, after we’d loaded up on food for the trip home, we made our way over to the gate, bought some water, lollies and waited for boarding. About an hour before departure I took 75mg of promethazine (it makes me sleepy) and then once on the plane I had another 25mg since I was still having trouble falling asleep. The second dose did the trick and I slept relatively soundly for most of journey back home. Now, I won't bore you with any of the details about our travel home once in Australia. It was pretty much the same as last time. Meaning that this trip report is finished! As you may have surmised we had a fantastic time in Japan and I've really enjoyed writing about our experiences with the hope that it will help and inspire future travellers. And perhaps induce nostalgia in those who have already been to Japan! The next post will be a wrap up similar to what I did for the 2012 trip report. As always, thank you very very much for reading my post(s), especially anyone who has battled all the way through the entire 150,000 or something words. And finally, please feel free to leave a comment! I really enjoy reading and replying to them! Thank you very much for reading my blog! What is this service talking about? SWET.jp and JAT.org are two organization for translators and writers who are interested in Japan. SWET has a free (open to all) mailing list that can be read on the web, and JAT has IJET networking conferences (held in Japan and overseas in alternate years). You can attend just the networking dinner as guest of a conference attendee. Thank you very much for this, I haven't heard of these organisations before and I'll definitely check them out! Sorry for my late reply also! I've been on holidays to Japan again, back now and unfortunately university and work starts again tomorrow. I won't have time to do big blog posts but I'm thinking about uploading photo's and a few words perhaps. I just loved Ginkakuji! Seeing your photos reminded me of my own trip. I think had a deja-vu feeling haha. I didn't visit sanjusangendo, but it likes really nice, I should visit it next time. I've very sorry for this late reply, I've been in Japan (again!) and stupidly managed to lock myself out of my google account- google is too suspicious. There are so many things to see in Kyoto- I've been there multiple times now and there is still heaps left to do- lots of things on your list of 101 things to do in Japan I've yet to do as well! Managed to tick a few more off this time though it seems. Thanks again for reading and taking the time to comment!